With cinematography clearly taking inspiration from the sort of high end documentary film making that the BBC are world renowned for, director Diego Quemada-Diez's Spanish language film The Golden Dream follows the journey of four Guatemala children as they follow their golden dream of making a life for themselves in the United States. The film has the viewer take an observational step back from the journey the children are on, to take in the breathtaking beauty of the countryside along with examples of the zenith and troughs of humanity. The three friends Juan (Brandon Lopez), Samuel (Carlos Chajon) and Sara (Karen Martinez) make their way on foot and by train without complaint but with a dogged determination that does not require explanation but action. 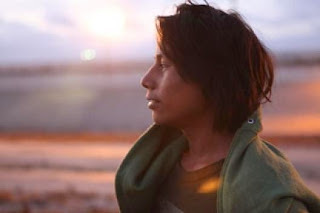 When they meet Chauk (Rodolf Dominguez) an indigenous boy, the dynamic of the group shifts and Juan struggles with his own racism towards Chauk as they journey together. The film unfolds rather than dictates it's message of the absurd restrictions we as humans, have placed on some people simply as a result of the geography that they were born into. The American Dream of wanting to strive to become something greater than one's beginnings is praised in some and considered a criminal act in others though they have done more, as exemplified by the children's journey, to have 'earned' the right to at least work towards their dreams. As in wild life documentaries, Nature is not automatically fair and the film delivers moments of great joy and also devastating ruthlessness. The four leads, all untrained actors, give performances so natural that one could easily be seduced into thinking The Golden Dream is a pure documentary. Stark realism and expert story telling causes The Golden Dream to linger as heavily on the mind as the well crafted silences that fill the film as richly as the countryside the children travel through. Interview with director Diego Quemada-Diez: just over half an hour, the director answers off camera questions regarding the inspiration for the film, the casting and his goals for the project. Articulate, interesting and nuanced answers are given which certainly enriches one's understanding of the film itself and of the themes the director wants to discuss. I Want to Be a Pilot Short film (9.27minutes) by the director. Shot in Kibera, the biggest slum in East Africa, I Want to be a Pilot is narrated by Omondi, a 12 year old boy who dreams of becoming a pilot so that he can fly 'far away' to where his dreams can come true, where he has a family, safety, food, a home and clean water. The frightening levels of poverty are shown in the film as Omondi walks around the slum, his wide eyes betraying all the hardships of his life while he still dreams of a happy future. Effective and affective film making. Extraordinary film. All the story based in real events that happened to many different people. A jewel.